Let me tell you from the start, there is no such thing as Hawaiian pizza, I mean it was not invented in Hawaii if you were wondering. Weird enough, according to Wikipedia, it was created by some dudes in Chatham, Ontario… that’s Canada :P and it consists of tomatoes, cheese, pineapple and Canadian bacon. ;) Ok fine, you can use any bacon then. 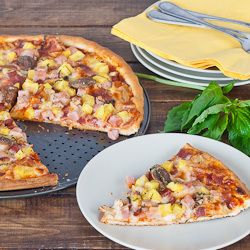 I will be using again my famous Easy Pizza Dough recipe, that can be turned into three medium pizzas… or two large ones in which case you need to adjust the quantities of your toppings. No big deal though, pizza is not rocket science, toppings are more a matter of preference, you can use less or more of them but try mine before you decide to go solo. Roll the piece of dough and don’t try to throw it in the air and whatnot, it only works with huge discs :P. Add your pizza sauce…now! Chop some ham and fry some bacon. Shiitake mushrooms and chop some pineapple as well. Fry the bacon, chop the ham. Get pineapple ready as well. I didn't chop my mushrooms on this one but it is up to you of course. Spread your goodies onto the dough, start with cheese, end with pineapple. Chop some basil on top of it as well if you want. This looks delicious. I’m scared of making my own dough so usually I’d use Pillsbury pizza dough but you’ve inspired me to make my own. I’ll have to try this soon. 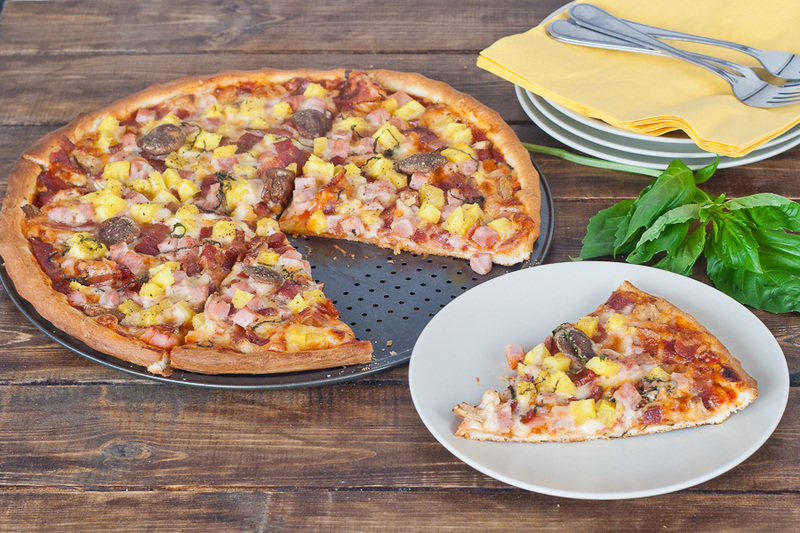 Bacon and pineapple are two of my favorite toppings on pizza. Yours look amazingly delicious!! Making your own pizza dough is easier than you think, you should really give it a shot. I was scared myself of trying to make the dough but let me tell you, this recipe is so easy, you can’t go wrong. Oh, did I mention that you will say goodbye to pizza delivery FOREVER? I’m definitely going to take your encouragement and dive in. I’ll follow the Easy Dough link you posted up top! Thanks again. Good luck! Make sure you post some pizza pictures. My Hubby makes wonderful pizza. I love your toppings selection. I found you through My Fudo – you have a beautiful blog!! OMG! Your photos are awesome! I love the looks of this pizza and I just have to make it. Of course now I am hungry for pizza! lol I have you saved – thanks for sharing! I don’t see a pizza dough recipe? There’s a link within the post. Click on it!